ATLANTA, GA -- A judge on Monday signed an order ending an ownership dispute over the Rev. Martin Luther King Jr.'s traveling Bible and Nobel Peace Prize medal that had essentially pitted the slain civil rights leader's two sons against their sister. The consent order signed by Fulton County Superior Court Judge Robert McBurney says the items are to be released to Martin Luther King III as chairman of the board of his father's estate but does not indicate what will happen to them after that. King's three surviving children - Martin, Dexter Scott King and Bernice King - are the sole shareholders and directors of the estate. Dexter is its president and CEO. During a board meeting in January 2014, the brothers voted 2-1 against their sister to sell the two artifacts to an unnamed private buyer. The items had long been in Bernice's possession, and the estate filed suit about a week later asking a judge to order her to surrender them. Bernice King said at the time that the idea of selling two of their father's most cherished items was unthinkable. King won the Nobel Peace Prize in 1964. The Bible was his personal traveling Bible and was used by President Barack Obama during his second inauguration in January 2013. A lawyer representing the estate said during a hearing in February 2014 that the brothers voted to sell the two items because the estate needed money. That same month, McBurney ordered the items to be placed in a safe deposit box with the keys controlled by the court. On Monday, McBurney signed an order submitted by the two sides that dismissed the lawsuit and said the keys to the safe deposit box are to be turned over to Martin. The bank is also to release the Bible, Nobel medal and its accompanying certificate and box to him. McBurney earlier this summer ruled that the Bible belonged to the estate, and Bernice's lawyers had filed a notice of appeal of that ruling. A trial on the question of ownership of the Nobel medal had been set to begin Monday. In a court filing last week, the chances of a settlement were described as "fair/poor." Eric Barnum, a lawyer for Bernice King, said by email that he did not have an immediate comment. Nicole Wade, a lawyer for the estate, did not immediately respond to an email seeking comment Monday. The dispute over the Bible and Nobel medal was originally set to go to trial in February 2015, but McBurney halted all action in the case to give the two sides a chance to talk and see if they could resolve their differences outside of court. Lawyers for both sides told the judge in May 2015 that they were close to an agreement but not quite there, and McBurney ordered mediation at the request of Bernice's attorneys. Former President Jimmy Carter in October confirmed he was working as a mediator in the case. McBurney said at a hearing in June that he had been willing to allow the long delays in the case because the issues at stake are very important. But he added that it's vital for the court to keep pending cases moving. He issued an order dated July 1 ruling that the Bible belonged to the estate, but he said the issue of ownership of the peace prize medal would proceed to trial because "genuine issues of material fact" remained. The case was the latest in a string of legal disputes that have divided the slain civil rights icon's children in recent years. Martin Luther King Jr. was assassinated in 1968. 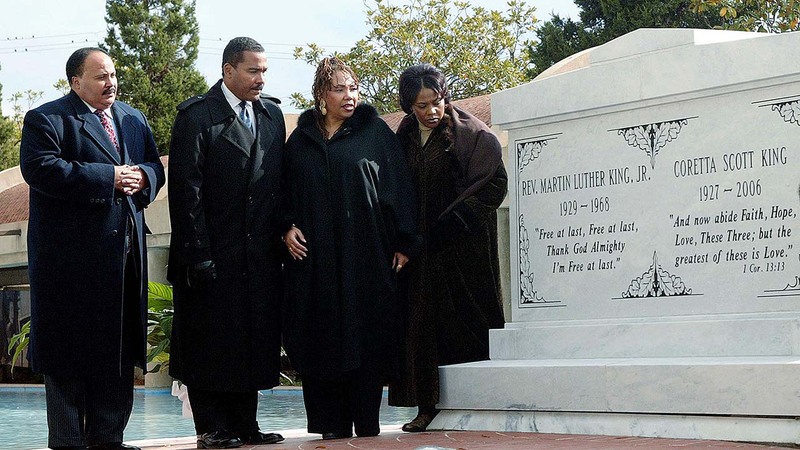 His widow, Coretta Scott King, died in 2006. Yolanda King, the Kings' eldest child, died in 2007.